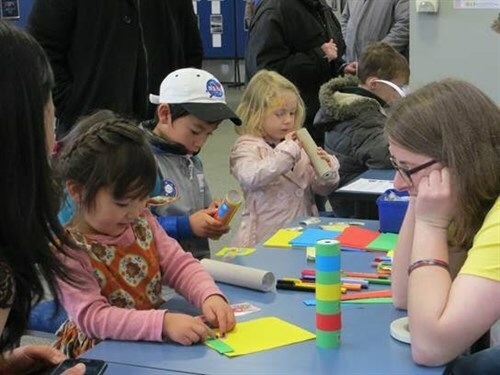 Thanks to ‘Free Resources’ we were able to source materials such as cardboard tubes, foam, long sacks and plastic bags to be used as part of our evolving art exhibition small modifications at the Dunedin Public Art Gallery. small modifications is a collaborative art project that builds on artist Xin Cheng and Chris Berthelsen’s ongoing field research and activities on everyday resourcefulness and improvisation. 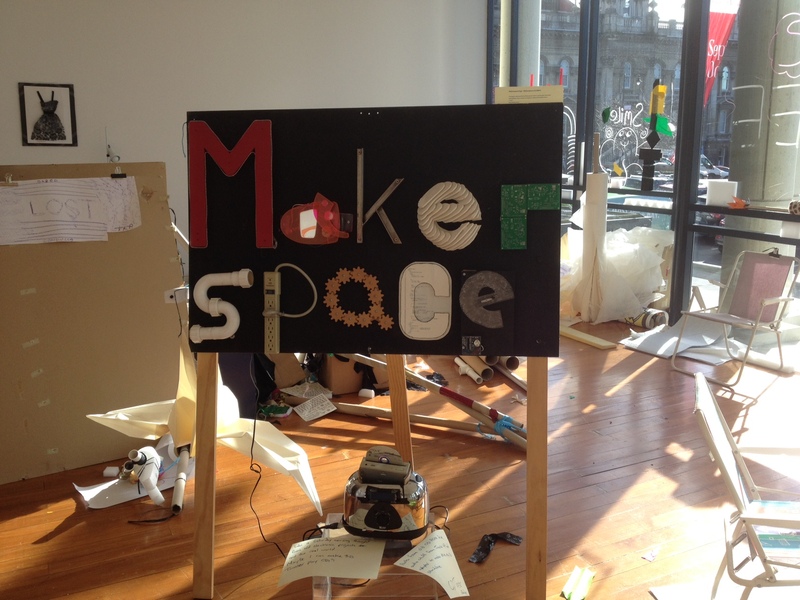 The project functions as an open shared studio, an interactive installation; a research and reading space and a social platform to trade skills and ideas. Over the course of five weeks small modifications will evolve through a series of informal encounters and organised activities, engaging with local community groups and gallery visitors. The project aims to highlight waste as a valuable resource and encourages visitors to make things using recycled materials. Using cardboard off-cuts upcycled with old book pages and gesso we created a community artwork expressing local perspectives on biodiversity, its value and how we protect it. Each postcard, after being hand printed by individual community members, was written on the back to expresses their personal pledge to get involved in local conservation work. This includes monitoring pest presence (installing and observing chew cards) or maintaining a rat trap and identifying the species caught. This enabled sharing of this data back with the Otago Peninsula Biodiversity Group, as key collaborators in this project. Cardboard was also cut into rounds and children made thaumatropes with relevant subject matter, like a possum in a cage or a bee on a flower. 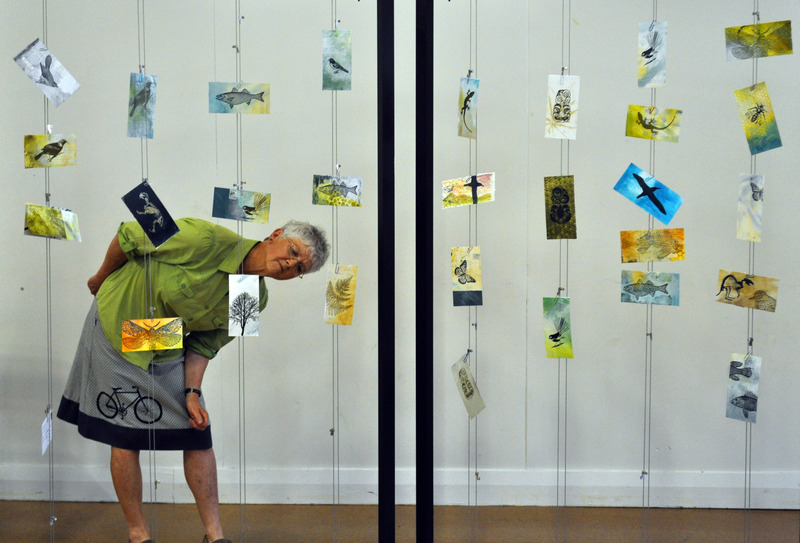 This combination of social art and citizen conservation action/science is being explored by 'The Sandpit Collective', an ongoing collaboration between Jenny Rock and Lynn Taylor, their students and community members near & far! Kaleidoscopes made from cardboard tubes! Over the weekend we used the cardboard tubes we sourced through you to make Kaleidoscopes at Luminescence: The Spectrum of Science. This was a science festival organised by University students to celebrate the International Year of Light. The Kaleidoscopes were a huge hit with all ages. Thank you! The children at Sawyers Bay School came up with a clever solution for our growing problem. When we plant vegetables, they are usually ready to be harvested over the summer holidays, so we needed to find a way to bring them on a bit sooner. A greenhouse was a perfect solution, but expensive. We came across a design for a plastic bottle greenhouse and decided that this would not only solve our problem but also provide a use for 1500 plastic bottles that may otherwise end up in landfill. 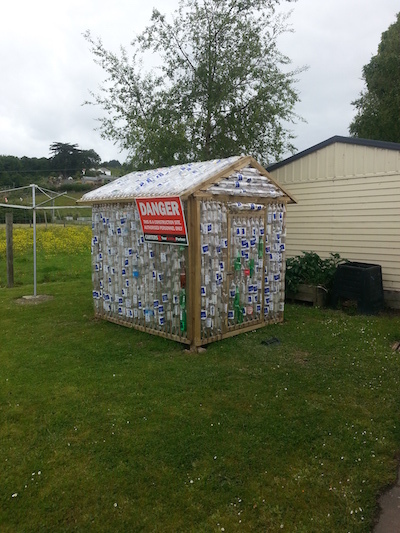 The children planned the design of our own bottle house, helped to build the timber frames and set the posts, and then put a huge effort into preparing the bottles ready to clad the frames. We finished the project just before the Christmas holidays so we haven't had a chance to try it out yet with planting. The children are currently busy preparing it now for spring by preparing the soli with our own compost. We can't wait to see results this year! 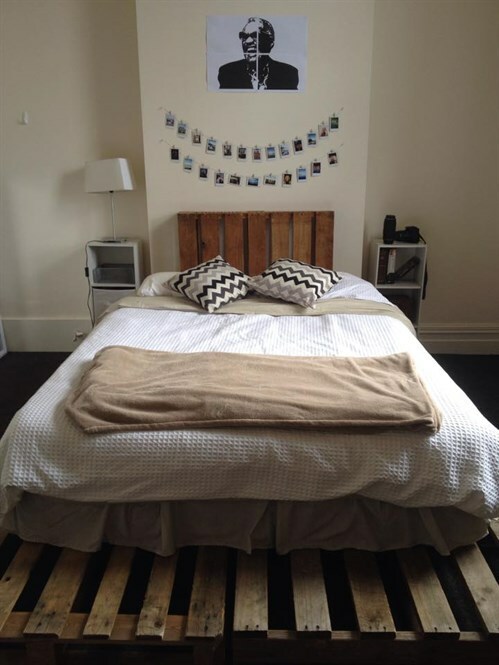 I used the wooden pallets to create a DIY bed base! I googled wooden pallets in Dunedin after having spent a while trying to find some. The site was super easy to use and I'm so glad I finally found some pallets! A FREE Garden Shed Floor! I recently sold my house in Hamilton and moved to Dunedin with my young family on the back of a transfer with the company I was working with. Unfortunately this was cancelled just before I was due to start work leaving me with no job and no source of income (my partner is at polytech). I had a large storage locker with household items in as my rental house is very small and with no garage (the only one we could find that were happy with our two big dogs so special thanks to our landlords). 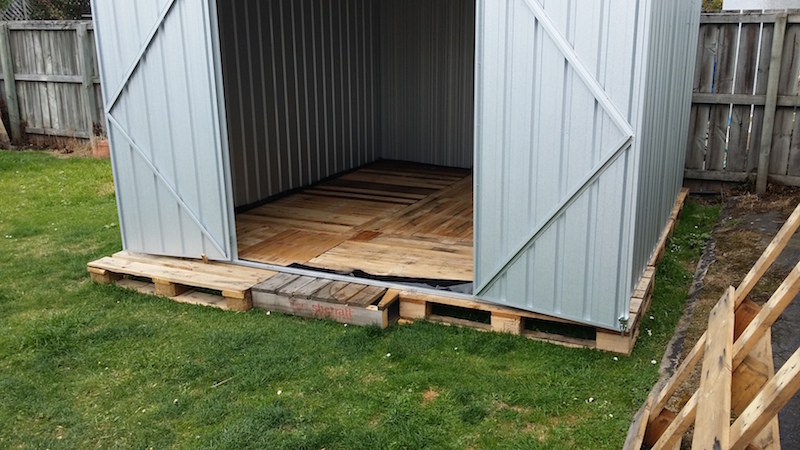 I bought a garden shed as 3 months of not having to pay for a storage locker would pay for the shed but the floors were really expensive and even buying timber to make a floor was still to much. So I came up with the idea of using pallets then some waterproof sheet then some dismantled pallets as floor boards. I drove around quite a few places but couldn't find anyone willing to give me any so I searched for free pallets on the net and I was rewarded with the freeresources.co.nz website they put me in touch with a local company who really helped me out (thanks John). I might still not have a job but I'm very happy with my shed floor thank you freeresources.co.nz for saving me a lot of money and stress.